The dovetail housing joint should first be carefully marked out with a marking knife, so as to cut across the fibres of the wood. For obtaining the bevel on the edge of the wood a joiner’s bevel may be used, and the angle should not be too acute. (See previous chapter.) Take a chisel and pare away a small channel as at A, Fig. 315, to form a small shoulder to guide the saw. Fig. 315.—Paring away Channel for Dovetail Grooving. With a fine tenon or dovetail saw, cut the saw kerf as at Fig. 316. If any difficulty is experienced in cutting the kerf true and square, you may resort to the method shown at C, Fig. 315; a small temporary piece of timber has been screwed on the top of the work to form a guide for the saw. Fig. 316.—Cutting the Saw Kerf. Fig. 317.—Old Woman’s Tooth Plane. Fig. 318.—Guide Block for Bevelling. Fig. 315, B, shows the small channel formed by the chisel prior to the sawing operation. The sawing of the bevelled side is worked in a similar manner; but occasionally we find amateurs who adopt the method shown at Fig. 318. A block of wood (H) is first made by boring a 11⁄4-in. 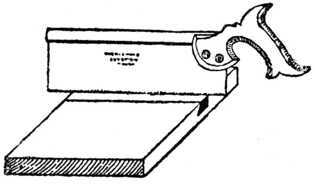 hole through its entire length, and afterwards making a saw cut at the desired bevel. 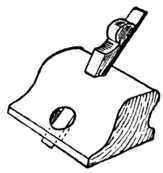 The object of this block, which is kept specially for the purpose, is to form a guide for those who have not full control of the dovetail saw; the back of the saw clears the hole, and the required bevel is obtained. When a saw cut has been made at each side of the groove, the surplus timber is pared away in the following manner: Cut away portion E, Fig. 319; then cut away portion F, and lastly cut away the apex portion marked G. Continue by this method of paring until the approximate depth is reached. To ensure a correct depth throughout the entire groove, the router plane (or, as it is often called, “the old woman’s tooth plane,” Fig. 317) is used. Fig. 319.—Showing Method of Paring. Fig. 320.—Channelling the Alternate Piece. With regard to cutting the alternate piece, it is necessary to first plane the end of the shelf true and square. With a cutting gauge strike the line K, Fig. 320; the required bevel on the edge (J) is then set out, and with the chisel a small channel is again formed. With the tenon or dovetail saw cut down the line K to the required depth, and carefully pare away the wood with a sharp chisel to the correct shape.